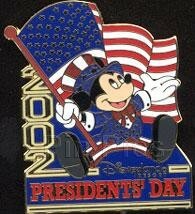 Presidents' Day 2002 a Patriotic USA Disney pin. This limited edition pin will be release at all DLR Pin Locations on Presidents' Day. It is Mickey dressed up in his presidential finery holding the American Flag with 2002 in gold on the side of the pin and Disneyland Resort's Presidents' Day on the bottom.